Actually, Zombie Weatherman’s reports tend to sound more like “Mnghfhghggghhh flfngnsaffffllhhh wmmmadfnnggghh”, but you get the picture. As you might expect, Zombie Weatherman is an app that gives you the daily weather with a healthy dose of zombie and cheesy music. 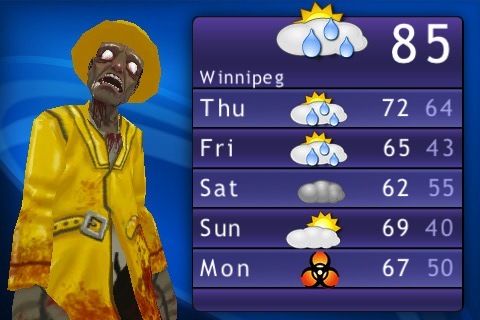 It’s really just a familiar 5-day weather forecast, but developer Clockrocket Games has seen fit to give us a friendly zombie to deliver the news. Enter in your choice of location and you’ll be graced with an “up to the minute” forecast and an interactive zombie dressed for the weather. He always predicts doom and destruction on the fifth day, so don’t pay that too much attention, but the rest of the weather should be more or less accurate. The forecast for my area didn’t seem terribly precise, but you’re not seriously relying on an undead creature who eats brains for your weather report, are you? There’s a fair amount of blood and guts involved if you’re inclined, but the zombie itself is fairly non-violent, even cuddly at times. He won’t try to eat your brains, and most of the time he’ll just kind of lurch from side to side moaning, but you’ll occasionally be able to make out words like “Raaaaaaaaaiiinn”, which is pretty entertaining. Also if you tap him, he’ll get smashed around with lots of flying blood. You can also pet him to heal any damage you’ve inflicted, and he’ll coo and hug himself affectionately. The various zombie costumes are plenty amusing, although you probably need to live somewhere with a lot of weather variation to see them all. You can, of course, use it to check other locations if you’re just curious. Again, the weather reports aren’t super accurate, so I’d really only use this for a cheap thrill, and there’s a free version available for the truly thrifty, but there’s also an ad-free version for only $1.99. Even though it’s not perfect, it’s good for a laugh, and zombie lovers will definitely get a kick out of this one. 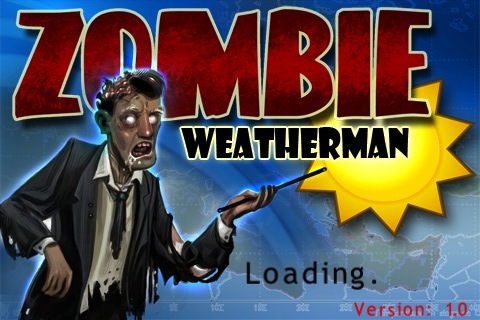 AppSafari review of Zombie Weatherman was written by Tracy Yonemoto on October 28th, 2010 and categorized under App Store, Fun, iPad apps, Weather. Page viewed 3781 times, 1 so far today. Need help on using these apps? Please read the Help Page.